you’ll always get what you’ve always got! No doubt when starting out in business you will have heard (apart from me already mentioning it!) how you should “Start with the End in Mind”. But you know what? It can be really hard to do if you don’t know what the “end” can look like. Building it to become more than your hobby is even bigger again. Not knowing the value of what you are building may prove even bigger again. In fact, building your Mother of a Business into an Asset may result in it being possibly the largest asset you’ll ever own, or second maybe to your home, so why is it not treated with the respect it deserves? Building a Mother of a Business as an Asset means it stands alone; having others work IN your business, as you work ON it, reaping the rewards along the way. But the time does come when you’re over it. Hard to believe I know, but it happens to the best of us! The “baby” you nurtured into the thing of beauty it is today eventually has to leave the nest, or you have to leave it, one or the other. When you’ve got to that point, and you’re feeling like you want it all to end is quite often the worst time to be thinking about how to get out, exiting or selling. Hasty decisions made quickly may not be in your best interest. It’s at this time when it’s really easy to just throw in the towel, walk away and “shut up shop”. Of course you can justify taking this course of action in a variety of ways but the end result is usually the same; all that blood, sweat and tears you invested, and not to mention the money, will have been for nothing! And, you wouldn’t want your family to see you all stressed and unhappiness levels escalate because you’re stuck doing something you no longer want to do? BUT you know you’ve spent too much of your precious resource – TIME – on this little baby to not get some sort of payback. The secret is, if you’re at the stage in your business that is OK for now, but you’ve come to realise it is not what you want to be doing for the rest of your life, that’s the time to plan your EXIT. is!) before it deteriorates to ugly divorce levels, where you just cut your losses and run! If SELLing is the preferred outcome, then it’s time to get strategic about how to do that, what necessary adjustments need to be made, and who that special someone will be that will love it as much as you once did. Think about it this way, as I’ve noted previously, would you put your home on the market without a little thinking and TLC driven renovation first? how much you’re prepared to invest in getting it ready. It depends on how much of a hurry you’re in also! It’s about behaving in a manner which builds a genuine business. And most of all it’s about having the confidence to do whatever you dream of achieving. I know that if you are going to make the most of your entrepreneurial mother® experience, you will need to change what you are currently DOing and the way you are currently DOing it. I built my Mother of a Business and then sold because it was time. I had lost my energy and enthusiasm, and I wanted to try something new and reenergising. Something that would again make me jump out of bed in the morning! 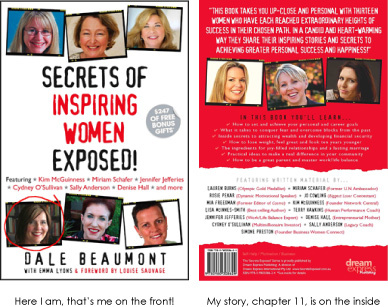 Of course, there’s a lot more to read in my chapter featured in the bestselling book Secrets of Inspiring Women Exposed, about me and my escapades to that point. I trust you enjoy it. the entrepreneurial mother® blog is also a great place to stay in touch as I’m always adding new thinking and ideas. You’ll find it here. Happy Mother of a Business building! The promise of the fairy tale – that Prince Charming marries you and takes care of you forever – usually remains far more powerful than the realities women see all around them. No matter what catastrophes befall their friends, sisters or neighbours, the lure of dependency keeps them mesmerised by a mythology that no dose of reality could break its hold on true believers – at least until such shocks are visited upon them personally. So the main thing I want to say to other women is this: PROTECT YOURSELF. Given the likelihood that you will have to fend for yourself (and even your children) at some point in the future, maintain the capacity to support yourself. Protect your children by making sure you can support them financially should anything happen to you, or their other parent. Protect your future happiness against the doubts harboured by frustrated stay-at-home mothers who can’t shake the guilt and regret they feel about failing to explore their full potential. Protect yourself against the desolation of the empty nest, which inflicts the deepest sense of loss on full-time mothers with no other identity to sustain them. Protect yourself against the feelings of uselessness and isolation experienced by so many women who didn’t cultivate meaningful work that would nourish them in later years.